NEO held a press conference Tuesday at the Samurai TV studio to announce the final card for the Etsuko Mita 20th Anniversary show and other upcoming events. But the big announcement was that NEO owner Kyoko Inoue is pregnant. How about that? As most fans are aware, Kyoko was diagnosed with cancer of the uterus in March and she has been undergoing treatment for that. It seems the pregnancy was discovered at that time. NEO GM Koda said they wanted to be sure Kyoko would be able to go through with the pregnancy before making any announcement. It's still going to be very difficult. Kyoko was having stomach pain on Monday night and checked into hospital. The baby is due on Oct. 26. They did not name the father but I can tell you Kyoko isn't married. She was divorced in 2000. Let's all hope this all turns out for the best and Kyoko has a happy & healthy child. The upcoming show announcements go like this. Last week I talked about the two day seminar and shows at Nagiita University on July 13 & 14. Jaguar Yokota, Yumiko Hotta & Manami Toyota participation was announced at that time. Ayumi Kurihara has been added along with the usual NEO crew of Yoshiko Tamura, Misae Genki, Tanny Mouse, Yuki Miyazaki, Haruka Matsuo, Aya Yuki & Nagisa Nozaki. They have added JWP's Azumi Hyuga, Sachie Abe, Tojuki Leon, Kaori Yoneyama & Arisa Nakajima. 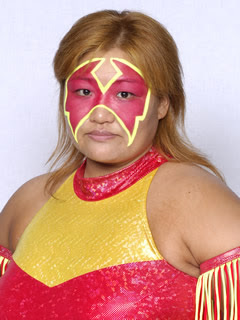 Summer Stampede 07 begins with Etsuko Mita's 20th Anniversary show on July 16 at Korakuen Hall. The main event will have Misae Genki & Haruka Matsuo defending the NEO Tag Team Titles against Yoshiko Tamura & Sakura Emi. There will also be a NEO New Beijing Army vs All China Womans Professional Wrestling tag match. It will be Tanny Mouse, Yuki Miyazaki & Shiryu vs Team Hsi Yu Chi. I don't know this for sure but this might be mystery wrestlers didguised as Chinese. It's supposed to be comedy. Etsuko Mita will team with Manami Toyota vs Kaoru Ito & Ayako Hamada. Jaguar Yokota will be involved in a tag match with a couple of the preteen Ice Ribbon wrestlers. Nagisa Nozaki will team with Aoi Kizuki vs Ayumi Kurihara & Shuu Shibutani and the opener will have Aya Yuki vs Hiroyo Matsumoto. They also announced that the July 29 show will be Nagano Pavillion in Ueda. This is Nagisa Nozaki's howetown so she will team with Jaguar Yokota against opponents to be named. Kaoru Ito, Ayako Hamada & Ray are scheduled as well. They also announced Summer Stampede will be in Nagoya on Aug. 25. Whatever happened to Bionic J?